Constructed with 100% thermally fused laminate for durability and superior resistance to scratches and stains. Accepts the addition of two Task Lights (sold separately) to enhance workspace illumination. Sliding doors protect open storage compartments. Mounts to either the 60W Double Pedestal Desk or the 60W x 60D L-Desk. Includes open work-in-process compartments to help organize papers. Includes back panel and Tackboard. Spacious storage options improve work-in-progress organization. The Enterprise Collection 60W Hutch offers a transitional styling that creates a professional impression anywhere. Constructed with 100% thermally fused laminate for durability and superior resistance to scratches and stains. 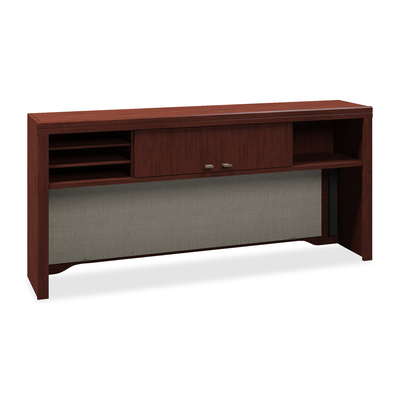 The 60W Hutch connects with the 60W Double Pedestal or 60W x 60D L-Desk to expand the functionality of your workspace. This component provides additional storage space for office files, decorative items and books, plus includes work-in-process compartments to help organize paperwork. The Hutch is built with sliding doors to protect open storage compartments and a back panel with a coordinating Tackboard, plus can accomodate an optional Task Light for additional illumination. Eliminate the chaos of cables, cords and plugs with our integrated wire management feature.